The banking royal commission has cast a shadow over the financial services industry since it was first announced in November 2017. The final findings are now live, and it's clear there are some key areas commissioner, Kenneth Hayne, has focused his attention. A key, and somewhat controversial, recommendation from the report is to see commissions phased out for those working in financial services — in particular, mortgage brokers and financial advisors. 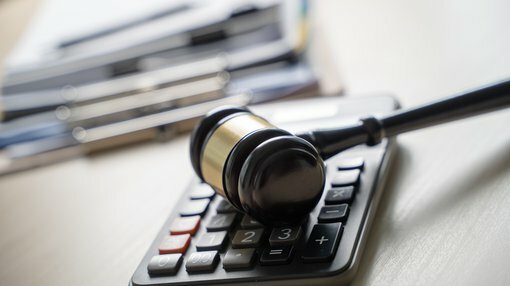 This reform is aimed at mortgage brokers who take commissions, including trailing commissions from lenders (in the majority of cases, the Big Four banks). It is also recommended that the financial advice industry be put under more scrutiny, and that the commissions-based structure be likewise dismantled in an effort to end the conflicted remuneration model advisors are currently governed by. This is a key issue of the final report, because while the federal government has agreed to adopt 75 of the 76 recommendations, the notable exclusion is the crackdown on mortgage brokers, which it will not be implementing because it claims it would harm competition. In response, the ALP has said it would implement the commission’s recommendations in full, offering another point of difference in the lead up to the May Federal elections. The release of the report has already impacted the financial industry’s performance. As The Age reported: Paul Clitheroe's financial advice company InvestSMART is up by 3.7% to 14 cents this morning. InvestSMART is already moving away from grandfathered commissions towards a fee-charging structure, despite earning $6.2 million from grandfathered commissions and rebates in the 2017/18 year. However, Australian Finance Group dropped 34% and Mortgage Choice was down 23%. To Hayne, and others, changing the mortgage broker system to require the borrower to pay the broker makes sense, and quickly clarifies exactly whose interest the broker is acting in — the borrower’s instead of the bank's. Some critics are arguing that removing the current commission model could lead to higher home interest rates for loans, which would result in customers ultimately paying more for home loans. Whether this argument holds weight or not, it would seem likely that the NLP will make a similar case given their unwillingness to act on the recommendations regarding mortgage brokers. Hayne has spoken out about the inefficacy of the two regulating bodies’ responses to wide-scale legal breaches, and the softness of their existing powers to address the issues. Despite that, he has recommended maintaining the APRA and ASIC structure. Hayne has recommended a clearer distinction between the two: APRA to be responsible for ensuring financial stability and ASIC tasked with taking enforcement action when institutions break laws. His recommendation is that both would be subject to oversight from a new body that should report twice a year (at minimum) to the minister regarding the performances of both regulatory bodies. It’s pertinent to note here that the current government is cutting funding for ASIC to a 15-year low, even in face of the royal commission into the banking sector. So, which party is in power will likely make a big difference to exactly how closely ASIC and APRA are reviewed, and to what degree their powers to act are upheld. If the watchdog mechanism breaks down, then arguably it will cease to matter what the recommendations actually say. As Hayne himself put it: "Misconduct will be deterred only if entities believe that misconduct will be detected, denounced and justly punished." With the royal commission having highlighted the fact that ASIC and APRA failed to use their powers to protect customers in an alarmingly high number of situations, how these bodies are brought into line will be vital to actual, long-term change. The Australian Financial Review was quick to publish that the Big Four banks — CBA, Westpac, NAB and ANZ — would be largely unshaken by Hayne’s final report, and their core businesses set to continue unscathed. With all four banks’ shares up in today's trading (Westpac up ~8% and ANZ ~7%), that seems like a fair appraisal of the situation. 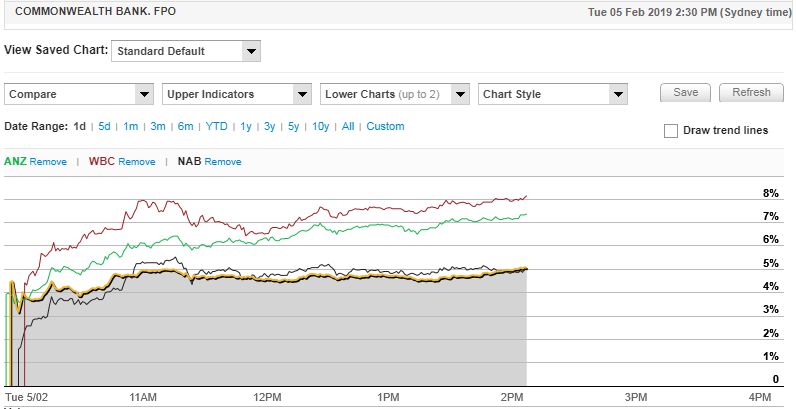 Big 4 Banks share price comparison over the course of the day. Source: Commsec. With no individuals named to face prosecution in the final report, and no urging to break up the Big Four, it could be argued that despite the many reproaches from Hayne, the banks have actually only received a slap on the wrist. Many people were hoping that ‘heads would roll’ given the shocking findings of broad scale unlawful practices, but instead there was only one bank that was given a proper talking down in Hayne’s final report. According to Hayne, the National Australia Bank has not seemed to learn from past mistakes; with his report highlighting, in particular, the poor performance of NAB’s leaders during the hearings. "NAB also stands apart from the other three major banks," he wrote. "Having heard from both the CEO, Mr [Andrew] Thorburn, and the chair, Dr [Ken] Henry, I am not as confident as I would wish to be that the lessons of the past have been learned. “More particularly, I was not persuaded that NAB is willing to accept the necessary responsibility for deciding, for itself, what is the right thing to do, and then having its staff act accordingly." During the commission, the chairs and CEOs of ANZ, Commonwealth Bank and Westpac offered apologies and admitted to their mistakes when compelled to appear at the royal commission’s hearings. In contrast, Dr Henry offered a combative response to questions. Hayne wrote in the final report that: "I thought it telling that Dr Henry seemed unwilling to accept any criticism of how the board had dealt with some issues.” He also said: “Overall, my fear — that there may be a wide gap between the public face NAB seeks to show and what it does in practice — remains." Following the criticism, Thorburn has cancelled a period of long-service leave to deal with the fallout. Yet, he refuted claims of dishonesty with regards to charging fees to customers without providing them any service saying it “wasn't dishonest, it was sloppy". This morning, Thorburn used the ASX to also refute claims that the bank did not "know what the right thing to do is". How NAB plans to rebuild trust in practical terms remains to be seen. The release of the commission’s report has, not surprisingly, prompted voters and party members on both sides to take aim at each other over their handling of the woes that have plagued the financial services industry for far too long. Former Prime Minister Malcolm Turnbull admitted regret for not acting sooner. However, as has been published widely in the last few days, Morrison and Frydenberg voted against the banking royal commission 26 times. No doubt the ALP are hoping that the government’s unwillingness to commit to Hayne’s recommendations in full will result in increased chances of winning back government come election time — particularly in light of the coalition’s background of longstanding resistance to the inquiry. Of course, none of these recommendations will stop either party from continuing to accept political donations from banks. For members of the public, the hope moving forward is that the inquiry can achieve the end goal of more prudent and transparent economic management, and an environment where trust can be restored.